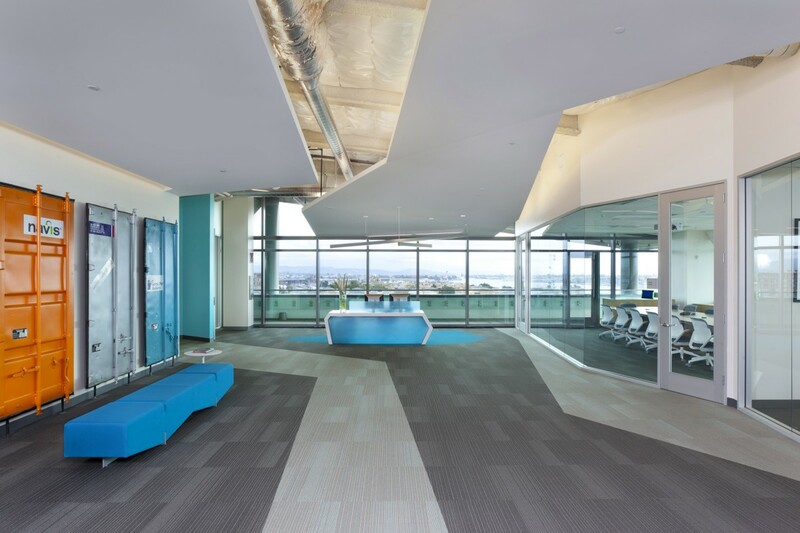 Dynamic architectural elements shape interconnected workflow at this global shipping logistics software headquarters. When Navis set sail for new headquarters at Oakland’s Jack London Square, it was an opportunity to invigorate a company culture that flows between collaborative and heads-down work styles. Programmers, explorers, big-thinkers, the high-tech firm has a fascinating focus: they create the technology that tracks cargo through the world’s shipping ports. 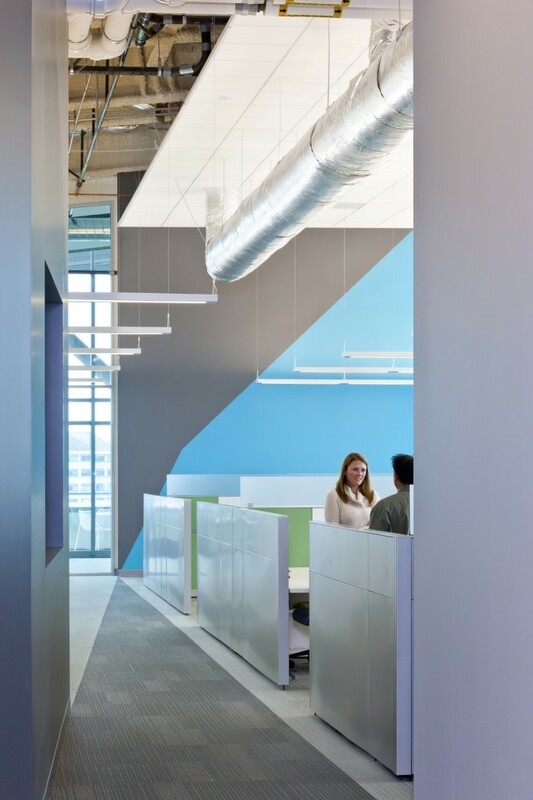 Working with a limited budget, RMW devised a 32,411 sf interior build-out that uses simple architectural elements – accent paint, carpeting, and ceiling and wall scrims – to encourage a directional flow toward cooperative gathering spots and stimulate interaction. The strong angles of the finishes simultaneously recall compass points, sails, and nautical flags. 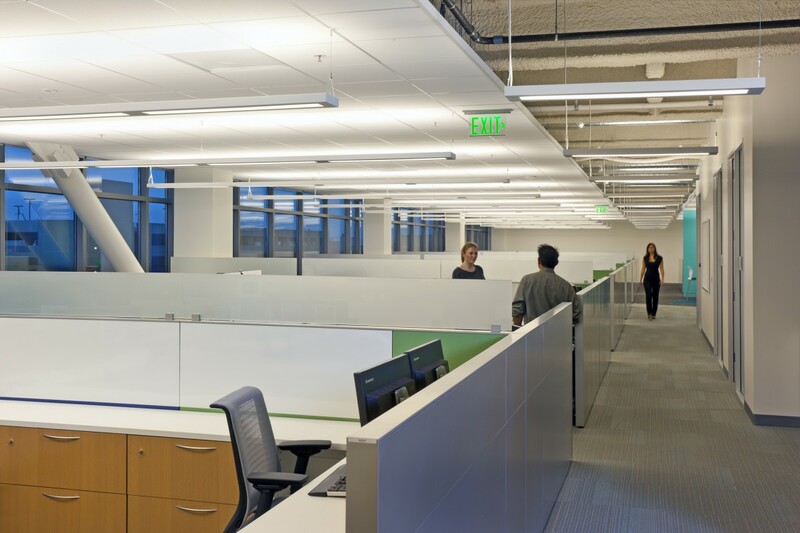 The design is organized to provide gathering spaces, open workstations, private offices, meeting rooms, and heads-down “pods” that can be easily navigated. Glass-walled meeting rooms along the expansive lobby’s ocean side allow daylight to spill through. 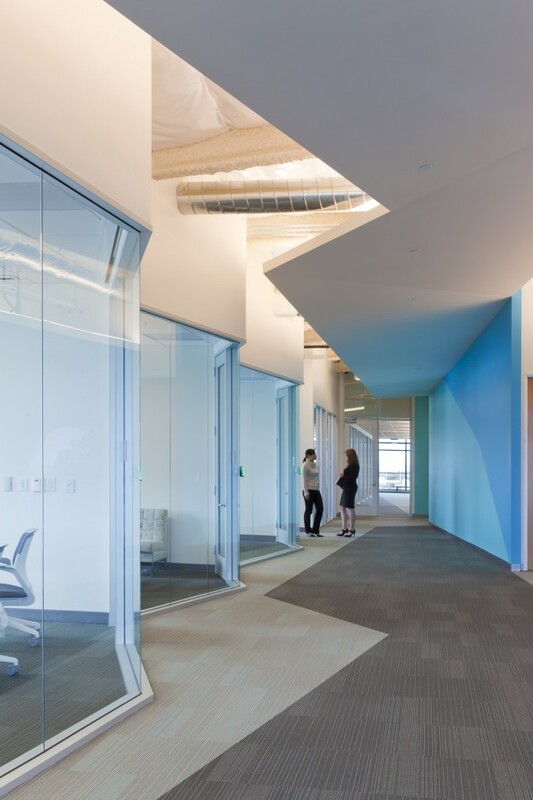 A central copy/mailroom on the sixth floor functions as a visual landing space, a nexus of pathways, accents, and angles. At the north end of the sixth floor, the cafeteria features a blue scrim that crests like a wave overhead. 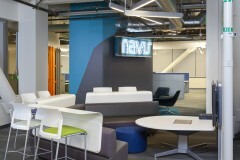 The result is a space that captures Navis’ corporate culture both aesthetically and functionally, marrying themes from shipping and technology and supporting the cross-team work tasks necessary to keep the world’s cargo trade shipshape. 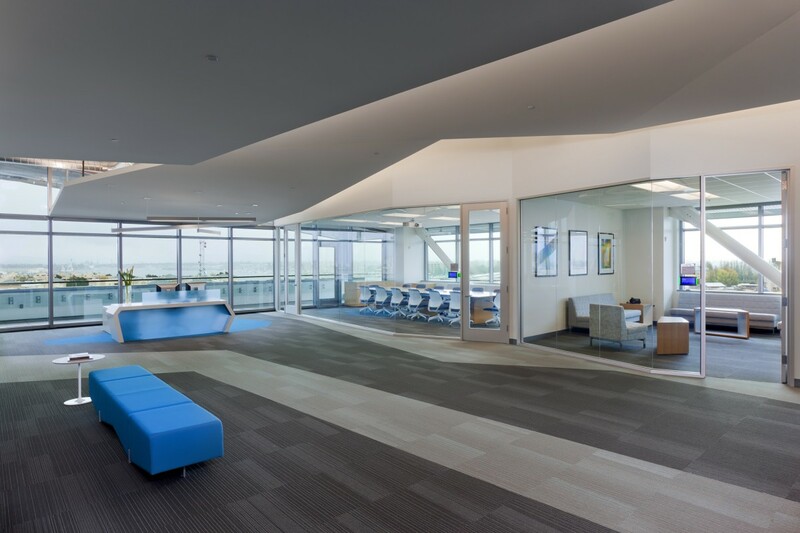 Navis’ offices overlook the Port of Oakland, the fifth busiest container port in the United States. The shipping container doors featured in Navis’ reception were relocated from their previous office and incorporated into the new design. 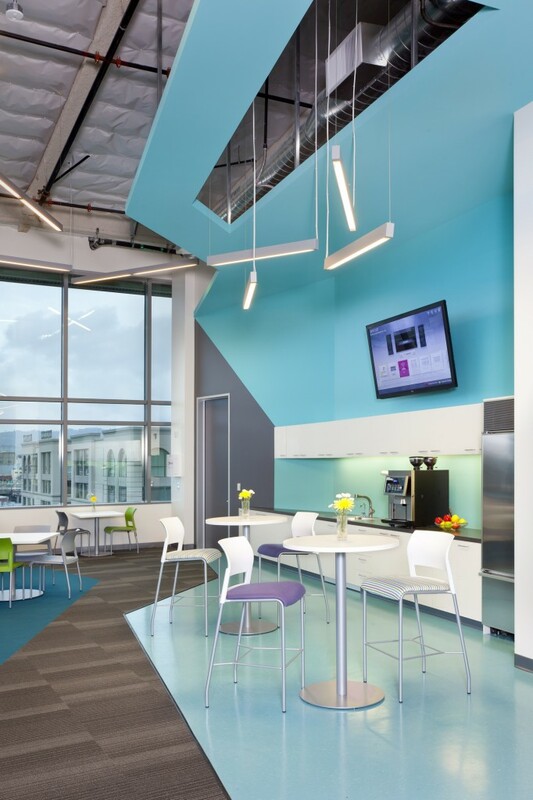 Award: The project was awarded the 2013 Design Is… Award, U.S. West/Mountain Region Category, by Shaw Contract Group.